Dental implantation is one of the most successful dental surgeries available, with patients increasingly opting for this procedure to replace missing teeth. Dental implants present a long-term solution to tooth loss, because they can be embedded in the jawbone the same way a natural tooth is. . Since implantation is a type of surgery, you’ll generally get the best results when it is performed by an oral surgeon or prosthodontist. The question that often arises for patients is whether it’s better to get multiple implants at the same time or whether they should be placed at different points in time. Here, find the answer to this common question asked to dental implant doctors. Are there greater health risks associated with one option or the other? In a word, yes; replacing teeth one by one carries a greater health risk. The reasons for this are complex, as they relate to the functioning of the stomatognathic system. The stomatognathic system describes the structures involved in speaking, chewing, swallowing, smiling, breathing etc. These structures are part of an interconnected system of nerves, facial organs, and muscles, which depend upon one another to ensure maximum functionality. While many patients receive dental implants for aesthetic reasons, the existence of the stomatognathic system has implications for long-term functioning. Say you have three teeth missing, with two gaps in the back and one in the front. Most patients prefer to place an implant in the front, because this is the more obvious gap. However, if you replace the teeth one at a time, with the back ones last, you will likely end up with a disbalanced system. Your front teeth are used for cutting and the back teeth are for grinding. 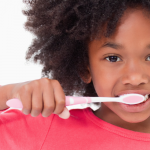 When molars are missing, the teeth in the front will end up bearing most of the burden of grinding. 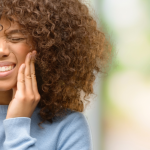 Because of the imbalance and dysfunction now introduced into the system, your teeth will actually begin to migrate towards the back of your mouth to compensate. 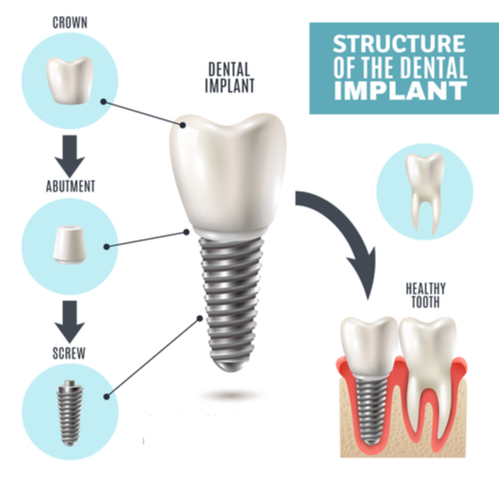 Months later when you’re ready for the implant, the entire system has begun to move around the problem area— leaving less-than-sufficient space for the new implant. This can lead to even more problems that affect the teeth’s appearance and functionality over the years, and of course, make it impossible to place a new implant. In other words, missing teeth affect many more aspects of your mouth than you might imagine at the outset. You could be lucky and only observe an aesthetic difference between implants placed initially and those placed later on— an effect similar to what it might look like if you repaired each pole of a house built on the beach, at different points in time. But you might be risking a far worse outcome in which the teeth and muscles in the system are weakened, causing imbalance. For these reasons, we highly recommend replacing the major missing teeth around the same time. Many patients are most worried about the amount of pain they will experience with dental implant surgery. They imagine that if one implant hurts, each additional implant will hurt that much more. However, the experience of pain actually isn’t quite so simple. Multiple implants might hurt more than a single implant, but having multiple implants placed one at a time will result in cumulatively more pain than doing it all in one fell swoop. Interestingly, most of our patients don’t complain about pain, and we use a relatively small amount of local anesthesia for each implant. Pain varies from person to person because it also has to do with how the individual patient perceives it. How does time affect my decision? Each surgery is preceded by a period of preparation and involves follow-up as well. 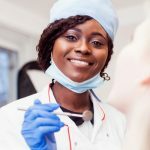 Before the operation, the dental implant doctor must examine the patient, update their the history and status, and ensure that there are no barriers to the procedure. Afterwards, follow-up visits allow the doctor to check for any potential problems before they present a danger to the success of the implant. Each implant process involves six weeks of integration with the bone before the false tooth can be placed. As anyone can see, doing the implants together reduces the overall treatment duration. It’s up to each individual, however, to consider how other commitments influence this decision. We hope that this blog has been helpful as you consider the various factors that weigh into your decision on the timing of your implants. For the health reasons described above, Penn Dental Medicine tends to recommend having all your implants placed all at once. In some cases though, it is not necessary to replace all the teeth; for example, you could receive one molar in place of the two missing teeth. You’ll have to talk to your doctor to receive a professional assessment on your specific case. 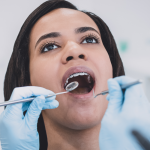 If you have concerns about financing this treatment, please know that Penn Dental Medicine takes special measures to permit greater access to our dental care. We offer reduced rates and payment plans to make it possible for patients of all income levels to receive the dental care they need. To learn more, please call our office at 215-898-8965 and schedule your first appointment with a Penn dental implant doctor. Don’t forget to use this $25 off coupon for your first visit!